For sports tourism, steps are now enforced to bring beach soccer to Bohol, especially in the resort island of Panglao where the kilometric stretches of white fine sand can provide a fitting venue for a national and even international soccer event. Thaddeus Simpao, president of the Bohol Football Association (BOHFA), said they are exploring the possibility of converting a public area portion into a standard field so a beach soccer event could start here. Simpao, who initially floated the idea of a beach soccer in Bohol on Facebook, received avid responses from soccer lovers all over the country, urging Bohol to finally take the cue. BOHFA has been successfully hosting competitions and local tournaments as well as in handling technical support for town club leagues and officiating requirements for 11-a-side, 7-a-side and the most recent futsal indoor soccer tournament here, Simpao said. In the aftermath of the megaquake that hit Bohol in October last year, BOHFA which is the only official organization accredited by the Philippine Football League (PFF), also joined sports relief programs, partnering with outside sports groups for sports relief programs and managed trauma debriefing through sports. And just as Bohol is now struggling to rise and shake off the trauma of the calamities that derailed its tourism industry, getting beach soccer in Panglao will present a new allure, he said. BOHFA plans to implement the activity this summer as it is the perfect opportunity for tourism promotions, while potential team players can also bring in their family for a vacation and join the game, coach Louie Supremo shared. 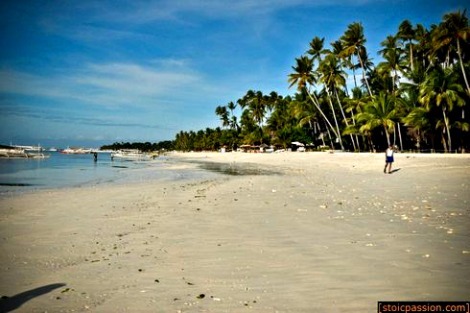 Both Supremo and Simpao cited a PFF team which BOHFA hosted in Panglao seeing the beach line and pointing to them the possibility of perfect beach soccer venue. "It’s a two-birds in one stone endeavor," Simpao said as he noted that an activity like this will boost local soccer clubs as well as bring in the needed tourists and help Bohol stand on its feet again. Beach soccer however has features that differentiate it from traditional 11-a-side football or futsal, making it a unique discipline, with certain rules that could not be set aside. Beach soccer matches are done in three matches of equal twelve minutes of play divided by quick three minute breaks, clocks stopping for goals or intentional delays by teams. Beach soccer matches also do not allow draws, a final three minutes of play is set as overtime in case of ties and a sudden death penalty kick ensues. First team to score wins. The match uses five players on each team: a goal keeper and four outfielders, the game allowing unlimited substitutions.